“We just sold another one!”, cried Dan Stuart after 25 people ordered “AED 50 for AED 100 Worth of Authentic Lebanese Cuisine at Mashawi” deal. Only few hours later the deal is sold 66 times. GoNabit.com is a new Shopping Social site that offers users the chance to get money off a different service or product each day if enough people across that city sign up. This is the first group-buying platform in the Middle East, launched in Dubai last week and will be available in Abu Dhabi shortly afterwards. Those of you tech-geeks readers are probably guessing it right. It is powered by Magento! When Dan Stuart approached us and presented the vision of the project, we knew it will be a challenge to build it in Magento. This is not a classic eCommerce store. There are no ordinary categories and products you are used to in Magento. Instead, we have a tailored shopping social platform with many custom features. We had a pleasure to work with two great individuals Dan Stuart and his co-founder Sohrab Jahanbani. They already have 22 deals scheduled over the next month, with daily e-mails going out to more than 2,500 people in Dubai and to a significant following on Facebook and Twitter. Every day GoNabit features one or two huge deals. Once there is a minimum number of buyers, deal ‘tips’ and the credit card gets charged. At this time GoNabit sends voucher to the buyer. Buyer can then print his voucher and take it to the local merchant for redemption. If the minimum number of purchases is not reached before the deal ends, no one gets charged and no one gets the deal. This is how social component and the community work together on boosting sales. 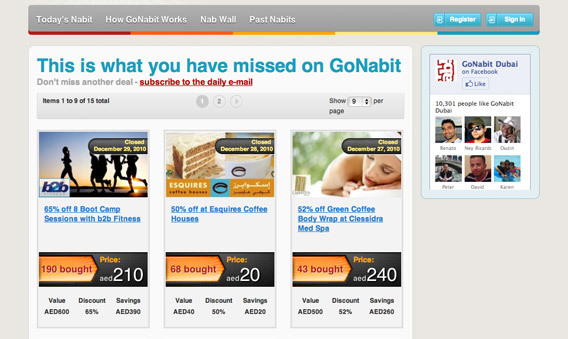 GoNabit became a popular topic in Dubai where people are chit-chatting about current deals on their coffee-breaks. June 2011 Update: Shortly after its first birthday, GoNabit was acquired by LivingSocial who is on the road for international expansion. 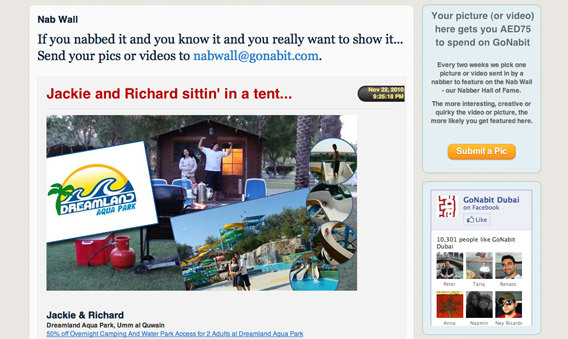 Site we developed does not exist in its original form, but you can see the screenshots to get a feeling of the design. 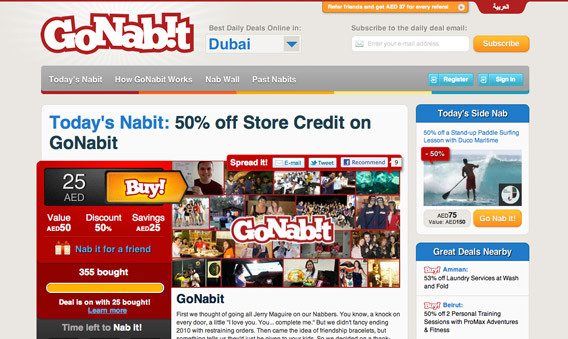 GoNab!t is the largest daily deal website in Middle East. Every day it features one or two huge deals. Once there is a minimum number of buyers, deal ‘tips’ and the credit card gets charged. At this time GoNabit sends voucher to the buyer. Buyer can then print his voucher and take it to the local merchant for redemption. If the minimum number of purchases is not reached before the deal ends, no one gets charged and no one gets the deal. This is how social component and the community work together on boosting sales. I just started learning about Magento. I’m still trying to understand when to use category vs attribute (filter) ??? How did you manage to filter by city? is city a category or an attribute for product? is the service (the restaurant or company whose coupon is being sold) they are selling an attribute to product? I tend to learn faster by analyzing other designs. hey tony, do you mind to contact me because i might want to create a website like gonabit.com. quote me thanks.